JIPMER PG Admit Card 2019: Jawaharlal Institute of Postgraduate Medical Education and Research (JIPMER) has declared the admission notification for those who wants to study MD/ MS / MCh/ DM/ Fellowship/ Ph.D/ Diploma. Check the complete detail in this article. To get admission in JIPMER, candidates will have to give entrance exam that is scheduled on 2nd December 2018. 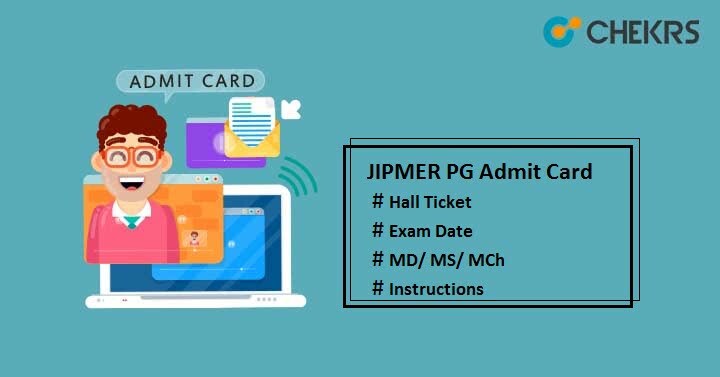 It is mandatory to hold a valid JIPMER PG Hall Ticket while appearing during the exam. Here we have shared the officially announced Exam Date for both sessions. Candidates looking for JIPMER PG Syllabus not need to worry because we have shared all exam study materials at the same place. Applicants, whose application form will be accepted by the authority, will only have the right to download their Admit Card through Online Mode. Follow the instructions in order to get the print of your admit card. Go to JIPMER official website i.e. jipmer.edu.in. Search for hall ticket download link in the notification or announcement section. Click on the given link “Download Hall Ticket for MD/ MS/ DM/ MCh/ Fellowship”. Enter the required details like User ID and Password and then click on “Login” button. You will see your “JIPMER PG 2019 Hall Ticket” on the screen. Download it and take the hard copy of the admit card for further references. Must download JIPMER MD MS Admit Card before the last date to avoid the last minute’s hassle. No one will be allowed to enter the examination center without a valid identity proof and hard copy of hall ticket. Do not tamper with your admit card. Keep it secure till the admission is not completed. Reach to the allotted center 1 hour before the commencement of test. Students are allowed to bring valid ID proof (Aadhaar Card/ e-adhaar card) and one photocopy of ID proof. Students from J&K, Assam and Meghalaya can carry Bank Passbook, Voter ID, Driving License, any other government id. Hope we have provided sufficient content to our viewers to help them in downloading the admit card. In case of any doubts, without hesitation ask in the comment section below.